How will constituencies change now that Ireland’s losing an MEP? Ireland’s representation in the European Parliament will be one person fewer next year. So who’ll get cut? The current setup of Ireland's European constituencies - a setup which cannot be maintained if Ireland is to lose one MEP. THE DECISION by a key European Parliament committee to redesign the makeup of the parliament from next year’s elections means Ireland is almost certain to lose one of its 12 seats. The arrival of Croatia within the EU means the parliament is stretched to its upper limit of 751 members, and seats need to be reapportioned from countries across the continent to make room for the 11 Croatian MEPs being elected in June 2014. Aside from presenting political problems for the sitting MEPs – obviously, 12 into 11 won’t go – the news of the inevitable loss presents a handful of new problems for those responsible for designing Ireland’s constituencies. A Constituency Commission was formed last year to take input from the public on how to reform the European constituencies, alongside the Dáil ones – but its terms of reference overlooked the difficulties of Croatia’s accession and assumed Ireland would get to keep its 12 seats. The commission duly recommended no change to the current design – something which will need a major adjustment now that Ireland has gone from 12 to 11. Although Ireland started out life in the European Parliament with 15 MEPs, the layout of our constituencies haven’t needed much revision whenever we’ve lost places to make room for new entrants – but this time the terms will be significantly different. The general guidelines for the size of Irish constituencies are laid out in electoral laws dating back to 1997, which establish the Constituency Commission in the first place. The same part of the Act governs how Dáil and European constituencies are set up – and, importantly, sets the same criteria for each. This means that, just like the constituencies for elections to the Dáil, European constituencies have to elect between three and five seats. This is a particularly crucial development: As it stands, having four constituencies with three MEPs happily satisfies these criteria. Reducing the overall number to 11, however, would mean having one constituency with only two MEPs – a system that simply won’t suffice. The only option is to radically redraw the boundaries and split the country into three. So how might that be done? One of the government announcements that didn’t get much notice last year was the government’s announcement on the reforming of Ireland’s eight regional authorities and assemblies. These are fora comprised of councillors from local authorities, and one of their tasks is to oversee spending from the EU’s structural funds. When Phil Hogan announced plans to reform local councils last year he also tabled plans to rationalise these assemblies, from eight to three – suggesting, perhaps, that the same structures could be replicated at European level. Not so, however – a quick look at the proposals (which controversially ask Dublin to share an authority with three-quarters of Leinster) shows that the populations covered by each case are simply incompatible with European constituencies. This is simply because the setup proposed by Hogan means almost half of the Irish population is under the jurisdiction of one authority (the Eastern-Midland one, which includes all of Leinster except Carlow, Kilkenny and Wexford), while less than a fifth is under the Connacht-Ulster one. In order to appropriately reflect the balance of population you’d again need to create a two-seat constituency – which simply cannot be done under current law. So that idea goes out the window. The question therefore arises about how best to minimise the disruption of redrawing all the boundaries. It doesn’t serve any major purpose to disrupt the entire country’s knowledge of their constituency or MEP, and successive commissions have always opted against large changes simply for the sake of it. So, let’s start by examining the constituencies as they currently stand. Here we have the traditional county Dublin, all of Munster (minus Clare) making the South, the rest of Leinster (minus Longford and Westmeath) making up East, and the rest of the country – the ‘Border, Midlands and West’ (BMW) region – named as ‘North West‘. Each constituency currently has 3 MEPs. If there must be three constituencies, they’ll need to be split either on a 5-3-3 or 4-4-3 basis. So – what are the options? This might perhaps be the most controversial of all – splitting up the Leinster territory among the three other constituencies, as if it were the spoils of war, while also diluting the singular power of Dublin. The historical County Dublin would lose the three-seater it holds to itself, expanding to a five-seater but also incorporating Louth, Meath, Kildare, Wicklow, Carlow and Wexford. 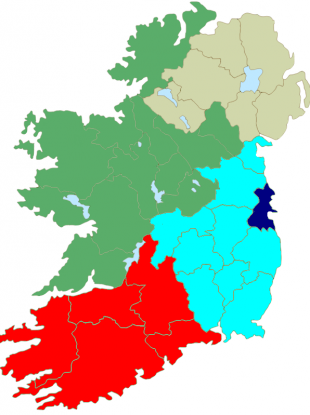 The remainder of the country could be lobbed into two 3-seat halves – the south containing all of Munster with the addition of Kilkenny (something hurling fans already believe to be the case anyway…) and with the midland counties of Leinster being attached to Connacht and Ulster. Going by Census 2011, this would give the five-seat constituency 46.3% of the Irish population (almost exactly 5 out of 11), with the north taking 26.5% and the south 27.2%. This has pros and cons – one advantage being it dilutes the standalone power of Dublin, which some would argue is already adequately served as a capital city anyway. A possible con is that the giant five-seat territory along the east could end up becoming Dublin-centric anyway – with the political parties fielding candidates from the capital with running mates from outside simply to mop up some extra votes. This provides the minimal disruption from the current situation – leaving Dublin as a standalone three-seater (with 27.7% of the population) and chopping the country into slightly unequal halves. This would see all of Munster joined with Carlow, Kilkenny and Wexford – turning the southern constituency into a four-seater (33.6%) – with the rest of the country another four-seater (38.6%). This has the advantage of offering the least tumult in transition – keeping Dublin precisely as-is, and only marginally expanding the south – but it does mean that the two new constituencies become particularly unwieldy. The North-West constituency, which already straddles all four provinces, would now stretch from Donegal to Wicklow, and Galway to Louth – a territory that has little in common in terms of social identity, and which would become a mammoth task for a single MEP to have to represent. The large geography also means that the Irish sensibility of having a ‘local’ MEP is destroyed: a major constituency like this could find its MEPs concentrated in the Meath-Kildare area and in Galway. Furthermore, this could arguably fail the legal demand of ensuring “reasonable equality of representation as between constituencies”, given the jump in populations between the two four-seaters. Switching Laois into the south could address this but also create an ugly jaunt, while attaching Laois to a region it does not naturally identify with. This option involves incremental changes to all three of the Dublin-north-south constituencies. The ‘Greater Dublin area’ (the four Dublin councils, plus Meath, Kildare and Wicklow) are added to Louth to make a single four-seater (with 39.3% of the population). The rest of the country is split along in a fairly straight line from Wexford to Clare – adding Wexford, Carlow and Kilkenny into Munster (4 seats, 33.6% ) and the rest with 3 (27.1%). While this has the most cosmetic benefit – it splits the country into three largely manageable chunks – it has some serious population flaws. The southern region manages to escape with one MEP for every 385,000 people – while the northern half only gets one for every 414,000, and Dublin merely one for every 451,000. The imbalance between the north and south could ideally have been solved by putting North Tipperary into the northern half, but this is not feasible given that the Dáil constituencies are now being merged, and the county councils themselves are being reunified from the next European election. There are no easy solutions to the muddle – but thankfully the next Constituency Commission won’t have to be convened immediately: the plans to reapportion MEPs between member states must first be approved by the European Parliament as a whole, and then by the head of every EU government. This could take a few months – giving prospective members time to meditate on the options. Email “How will constituencies change now that Ireland’s losing an MEP?”. Feedback on “How will constituencies change now that Ireland’s losing an MEP?”.